Michael Jackson alive and living in Dubai? Footage claiming to show Michael Jackson stepping out a coroner’s van after his death is being seized upon by conspiracy theorists who believe that the King of Pop is still alive and moonwalking. “I got the original video tape from a trustworthy source. I know him for years. And I am sure it’s real and Michael is alive”. The video is latest in a long line of claims made by devoted fans and conspiracy theorists that Jacko staged his own death. Reported sightings of the late King of Pop include a man hiding behind a scarf in the Hilton Dubai; a gloved man hiding under an umbrella in Australia; a white-clad figure surrounded by bodyguards and moving noiselessly in soft white slippers across a gas station forecourt in Spain; plus a whole manner of supernatural sights by fans across the world. So, two months on from the day the world was rocked by the death of the world’s greatest pop superstar, where might Jacko be now if he really did stage his own demise? Jacko packing plastic in Dubai? Dubai is very Michael Jackson – plastic, plastic, a bit of marble, plus a load more plastic – indeed, so outrageously ostentatious you’re left feeling never quite sure if it’s on top of the world or merely a wacko dust bowl that’s about to go horribly pop. With room rates and real estate taking a serious battering over the past 12 months, a cash-strapped Jacko would be sure to live like a pampered king in Arabia’s very own Disneyland, even if he had to perform a song or two at the Dubai Mall to cover his room service. And where better to hang out with his kids than the mighty Burj al Arab, voted “World’s Leading All-Suite Hotel” at the travel industry’s very own Oscars, the World Travel Awards. Equally important (for Michael anyway), it is the world’s tallest hotel at 321 metres, making it ideal to dangle toddlers out of the penthouse window without getting spotted by the paps lined up at the entrance. The Burj also boasts its own Rolls Royce fleet, Versace bedspreads and private shopper and helicopter landing platform. When the scorching midday sun has abated, the Jackson clan could head to Dubailand - a Disney-inspired theme park on the outskirts of the city. 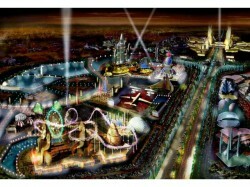 The credit crunch has curbed plans to turn this into the world’s biggest theme park. Instead Michael could settle for wandering freely around the half-finished project, feeling just like he was in his very own theme park back home in Neverland, complete with creditors about to knock on the front door. Michael Jackson’s fascination with Egypt was immortalised in his 1992 hit “Remember the Time” – and its ground-breaking video in which he re-incarnated himself from his past life in front of astonished Pharaoh (played by Eddie Murphy) and Mrs Pharaoh (played by David Bowie’s other half, Iman). 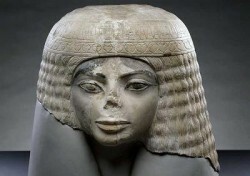 In the video Jackson looked almost identical to a statue of a 3,000-year-old Egyptian limestone bust, right down to the woman’s disintegrating nose (no relation to Kerry Katona). The statue has been on display at Chicago’s Field Museum since 1988, and thousands of mourners have flocked there to pay tribute to the late star. With its pyramids and ancient monuments, the land of the pharaohs would certainly be a possible spot for the King of Pop to duck out of the public glare and get down to the serious business of moonwalking and songwriting. And nowhere better would he find peace than the country’s leading resort – the Savoy Sharm El Sheik. Its Queen Cleopatra Villa would be right up Jacko’s street – a beyond-luxurious suite designed to look like an ancient Egyptian tomb. He’d even have a butler on hand to cater to Bubbles’s even whim, although an oxygen chamber doesn’t come as standard. Michael Jackson fell in love with the Ireland’s rolling hills and laidback charms when he holidayed there two years ago. He spent three months acting out his childhood fantasises at Luggala Castle in County Wicklow, forking out £20,000 a week for the seven-bedroom fairytale retreat, with a team of butlers, chefs and cleaner to cater to the troubled star’s every whim. At one stage it was reported that he wanted to move to Ireland permanently and had bought Luggala, which had previously been owned by the Guinness family. So could the King of Pop be living out his days in Ireland’s rolling hills? Spotted MJ on your travels of late, or do you have any suggestions of hotels where he might be now?